"I had purchased a wedding dress off the shelf. Needless to say the dress has probably been tried on by hundredsof brides, there were quite a few spots on the dress, including deodorant and makeup. Hearing Jim from Daisy Cleaners in Salem, NH was the guy to go to, I drove 5 hours from Northern NY to bring my dress to him. Jim not only cleaned the dress the same day (something he said he had only done twice), he made it look as though no one ever tried it on...it was spotless and perfect. 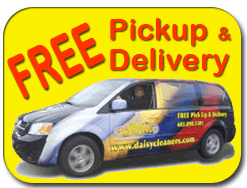 I would highly recommend Daisy Cleaners; the price was amazing and the service was like nothing else. I will be bringing my dress back for cleaning after the wedding...5 stars! "— A very happy bride. "Jim, the owner, is amazing!! I took my wedding gown to him to clean before I donated it to charity and he cleaned it for me for free because I was donating it! I cannot tell you how unique this is as other places I called to see if they could even clean wedding dresses gave me quotes for hundreds of dollars. Not to mention what a fantastic job Daisy does. Jim treats every wedding gown as if it were his daughter's own. I cannot say enough good things about this place. I highly recommend it to anyone!! Thank you everyone at Daisy! :)" —Tiffany B. “What a wonderful locally owned and operated business! I brought a comforter to Daisy cleaners and they did a professional job. They also have been cleaning winter coats for free that are brought in from Ski Haus's annual coat drive. These coats are donated to shelters in Lawrence, MA. 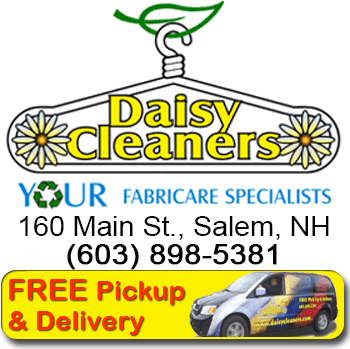 Daisy Cleaners is a great example of a small local business supporting the community in which they operate!” —Kelly P.
“Love Daisy! This has been the best dry cleaners I have ever used. Staff is amazing. The BEST customer service ever. The prices are very fair and competitive with the area. My husband is incredibly picky about his shirts and he is always happy with Daisy. If you live in the area and have the opportunity for the at-home delivery, it is such a life saver. Daisy deserves more than five stars!” —Amanda E.
"The owners care about the customers and delivering good value and superior services. Very supportive of the local community." - Henry G. “Absolutely the best quality and service - I'll be a fan and customer for life!” —Jill H.
“I accidentally washed several polo shirts in hot water and of course they shrunk. I took them to Jim at Daisy Cleaners and they were able to easily re-size them so now they fit perfectly again. If I had tried to do that myself I'm sure they would have all ended up misshaped and looking terrible. Thanks Jim!” —Chris R.
“The service and the staff is amazing. The owner has "never" failed me with get anything out of my clothing. I had a jacket with all blue dye on it and other items with stains that I tried and tried to get out, I tried everything and I couldn't get them out. Even after this effort, they were able to get all the stains out. In the past I had nail polish, paint, grease, glue...all were removed by Daisy Cleaners. The staff is wonderful and so excited to work for this place. The must treat them great or hand pick them because they are as nice as he is. GREAT JOB DAISY'S CLEANERS!! !” —Rose P.